© Alepuz et al. ; Licensee Bentham Open. It is estimated that approximately 5% of glenohumeral instabilities are posterior. There are a number of controversies regarding therapeutic approaches for these patients. We analyse the main surgery alternatives for the treatment of the posterior shoulder instability. We did a research of the publications related with posterior glenohumeral instability. There are conservative and surgical treatment options. Conservative treatment has positive results in most patients, with around 65 to 80% of cases showing recurrent posterior dislocation. There are multiple surgical techniques, both open and arthroscopic, for the treatment of posterior glenohumeral instability. There are procedures that aim to repair bone defects and others that aim to repair soft tissues and capsulolabral injuries. The treatment should be planned according to each case on an individual basis according to the patient characteristics and the injury type. Surgical treatment is indicated in patients with functional limitations arising from instability and/or pain that have not improved with rehabilitation treatment. The indications for arthroscopic treatment are recurrent posterior subluxation caused by injury of the labrum or the capsulolabral complex; recurrent posterior subluxation caused by capsuloligamentous laxity or capsular redundancy; and multidirectional instability with posterior instability as a primary component. Arthroscopic assessment will help identify potential injuries associated with posterior instability such as bone lesions or defects and lesions or defects of soft tissues. The main indications for open surgery would be in cases of Hill Sachs lesions or broad reverse Bankart lesions not accessible by arthroscopy. We indicated non-anatomical techniques (McLaughlin or its modifications) for reverse Hill-Sachs lesions with impairment of the articular surface between 20% and 50%. Disimpaction of the fracture and placement of bone graft (allograft or autograft) is a suitable treatment for acute lesions that do not exceed 50% of the articular surface and with articular cartilage in good condition. Reconstruction with allograft may be useful in lesions affecting up to 50% of the humeral surface and should be considered when there is a situation of non-viable cartilage at the fracture site. For defects greater than 50% of the articular surface or in the case of dislocations over 6 months in duration where there is poor bone quality, some authors advocate substitution techniques as a treatment of choice. The main techniques for treating glenoid bone defects are posterior bone block and posterior opening osteotomy of the glenoid. The treatment of the posterior glenohumeral instability has to be individualized based on the patient´s injuries, medical history, clinical exam and goals. The most important complications in the treatment of posterior glenohumeral instability are recurrent instability, avascular necrosis and osteoarthritis. Keywords: Shoulder, Instability, Posterior instability, Glenohumeral instability, Shoulder arthroscopic, Shoulder surgery. It is estimated that approximately 5% of glenohumeral instabilities are posterior [1-3] and involve a wide pathoanatomic spectrum of lesions that may affect the labrum, the capsule and bone architecture. The most common type of posterior instability is recurrent posterior subluxation. There are a number of controversies regarding therapeutic approaches for these patients, due in part to a lack of understanding of the pathophysiology of posterior glenohumeral instability . Part of the controversy stems from the fact that in many cases, there is no single or essential injury that explains the occurrence of a posterior glenohumeral instability, as various pathologies responsible for the injury coexist together, making diagnosis and treatment difficult . Conservative treatment has positive results in some patients, but between 65 and 80% of cases show recurrent posterior dislocation in some series. Surgical treatment is indicated in cases of failure of conservative treatment, and the results have been less satisfactory than those published for anterior glenohumeral instability, with surgical treatment failure rates between 30%-50% . Nonsurgical treatment is the first therapeutic option in posterior glenohumeral instability  and involves rehabilitation treatment aimed at increasing the stability of the glenohumeral joint [8, 9] and strengthening shoulder rotator muscles, mainly the external rotators (infraspinatus and teres minor), the posterior deltoid, and scapular stabilizers (trapezius and serratus anterior), along with proprioceptive rehabilitation programs for the joint [10, 11] and modifying the patient’s sports and/or work activity. The main goal of the rehabilitation program includes restoration of the scapulothoracic and glenohumeral kinematics. Although strengthening exercises do not decrease hyperlaxity of the glenohumeral joint, they improve control and function of the shoulder joint . To improve scapula control, the program should focus on postural corrections, scapular muscular strengthening, and scapular neuromuscular control. Some exercises to achieve these goals are: prone horizontal abduction on a stability ball, lower trapezius robbery movement wall slides, prone rowing into external rotation on the stability ball, and scapula neuromuscular control drills. In addition, rotator cuff muscle strengthening, specifically the external rotators and the posterior deltoid are emphasized. Specific exercises routinely performed are rhythmic stabilization (external and internal rotation), side-lying external rotation, standing external rotation with resistance bands or a cable column, prone rowing at 90º of abduction and prone horizontal abduction with full external rotation . In the nonsurgical treatment the patient is instructed to avoid pushing motions, horizontal adductions and excessive internal rotation. According to some series, nonsurgical treatment is successful between 70% and 90% of the time, especially in those patients whose mechanism of injury is repeated microtrauma [8, 9]. However, in posterior glenohumeral instabilities of traumatic origin with lesions in the capsulolabral or bone complex, most authors agree that non-surgical treatment leads to poor results; in these cases, it would not be necessary to fulfill six months of rehabilitation treatment before considering a surgical option [4, 7, 11]. In the last decade, arthroscopic techniques for the treatment of posterior glenohumeral instability have increased . Numerous published studies show high rates of good results with arthroscopic treatment [15-18]. Open surgery techniques are still used mainly for the treatment of glenoid and humeral bone defects and in corrective osteotomies in dysplasias and glenoid retroversions. 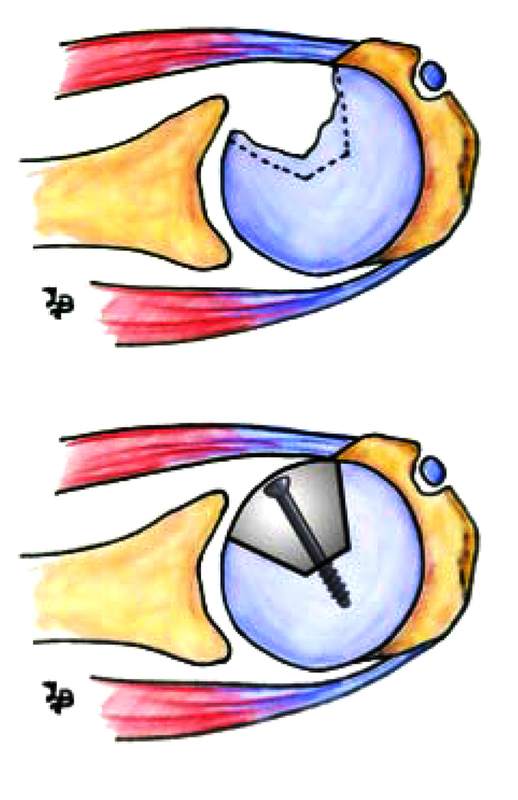 There are two options for surgical management in glenohumeral instabilities depending on the cause leading to instability: open or arthroscopic procedures that aim to repair bone defects (whether at the level of the glenoid or the humeral head) and open or arthroscopic procedures that aim to repair soft tissues and capsulolabral injuries. Obviously, some patients will require procedures on bone defects and soft tissues within the same surgical procedure . There are multiple surgical techniques, both open and arthroscopic, for the treatment of posterior glenohumeral instability. When indicating a surgical technique, multiple factors have to be taken into account, such as the age of the patient, the cause of instability (traumatic or atraumatic), the severity of the injury (luxations or recurrent posterior subluxations or microinstabilities), the pattern of instability (unidirectional or multidirectional), the type of patient and his/her functional demands (athletes versus non-athletes, and more specifically, throwers) and the presence or absence of associated lesions (superior labrum anterior and posterior [SLAP], rotator cuff tears, long head biceps tendon lesions) [5, 20]. The treatment should be planned according to each case on an individual basis according to the patient characteristics and the injury type. Open or arthroscopic surgical treatment is indicated in patients with functional limitations arising from instability and/or pain that have not improved with rehabilitation treatment. 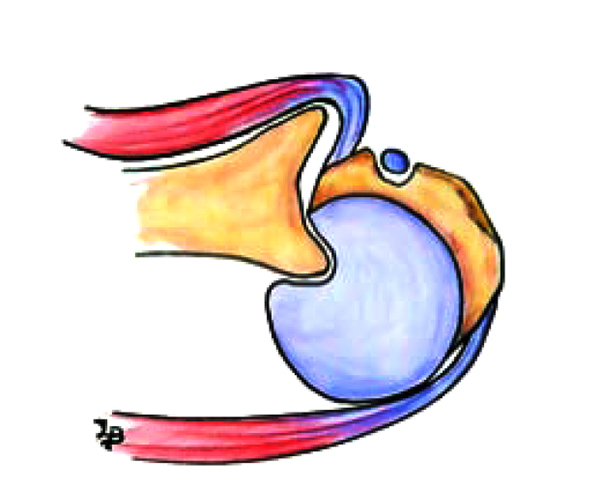 The indications for arthroscopic treatment are recurrent posterior subluxation caused by injury of the labrum or the capsulolabral complex; recurrent posterior subluxation caused by capsuloligamentous laxity or capsular redundancy; and multidirectional instability with posterior instability as a primary component . Relative contraindications of arthroscopic surgery include  lack of arthroscopic surgical skill on the part of the surgeon and extensive bone lesions (reverse Hill Sachs or reverse Bankart lesion) that require the use of subscapularis transfer, allograft or osteotomy. Arthroscopic surgical techniques have been described for the management of bone defects. Poor capsulolabral tissue and previous open surgery are also relative contraindications. The main indications for open surgery would be in cases of reverse Hill Sachs lesions or broad reverse Bankart lesions not accessible by arthroscopy. Surgery is contraindicated in cases of habitual voluntary posterior glenohumeral instabilities and with uncooperative patients or those with underlying psychiatric disorders. Although voluntary posterior dislocation is not an absolute contraindication , the mental state of the patient must be taken into account before considering the surgical option due to the high rate of poor results . The chronicity of the lesion, the bone quality, and the general condition of the patient must be evaluated because in cases of chronic dislocations in which the patient has minimal pain with acceptable function, low functional demands, or older age, therapeutic abstinence as the treatment of choice must be considered . Although procedures for bone defects have traditionally been associated with open surgery techniques, in recent years, multiple arthroscopic surgical techniques have been described for the management of bone defects, especially for the glenoid [4, 23]. Anatomical techniques have better clinical results compared to non-anatomical procedures, particularly if they have been performed arthroscopically . Technical reconstructions of bone defects of the humeral head are used for reverse Hill-Sachs lesions that (Fig. 1), due to their size or location, induce symptoms of instability or dislocations and also in the treatment of inveterate posterior dislocations of the shoulder with involvement of the humeral head [19, 25, 26]. Fig. (1). Reverse Hill-Sachs lesions. For small lesions affecting less than 20-25% of the articular surface after reduction of the dislocation (in cases of inveterate dislocations), orthopedic treatment in some patients, especially those not amenable to surgery, should be considered . In 1952, McLaughlin  described the transfer of the subscapularis tendon insertion and its suture at the site of the reverse Hill-Sachs lesion to limit maximum internal rotation and to prevent engagement of the humeral defect in the posterior part of the glenoid (Fig. 2). This non-anatomic humeral defect reconstruction technique is performed by a deltopectoral approach. Different arthroscopic techniques for performing a modified McLaughlin technique have been published [29, 30]. 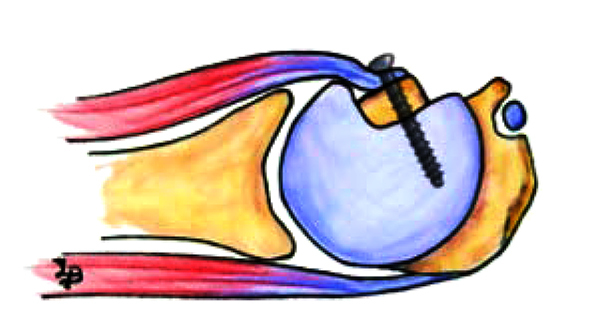 In 1987, Neer et al..  described a modification of the McLaughlin technique for the transfer of the subscapularis tendon with the lesser tuberosity (Fig. 3). The purpose of this modification is to facilitate the fixation of the subscapularis tendon, as it is a bone-bone fixation. Fig. (2). The transfer of the subscapularis tendon insertion and its suturing at the site of the reverse Hill-Sachs lesion. Fig. (3). The transfer of the subscapularis tendon with the lesser tuberosity. Arthroscopic and open surgery variations are reported on the literature by plication of the subscapularis without detachment of the tendon [30, 31]. This technique effectively avoid the bone defect to engage on the glenoid rim . We prefer non-anatomical techniques (McLaughlin or its modifications) for reverse Hill-Sachs lesions with impairment of the articular surface between 20% and 50%. Another non-anatomical technique is rotational osteotomy of the proximal humerus [27, 32-34]. This technique is rarely used today due to the risk of avascular necrosis of the humeral head and osteoarthritic progression of the joint [6, 35, 36]. The rate of postoperative complications detected in a systematic review with this technique was 29%, a mean postoperative Constant score 79 and the rate of recurrence was 5,6% [37, 38]. Disimpaction of the fracture and placement of bone graft (allograft or autograft) is a suitable treatment for acute lesions that do not exceed 50% of the articular surface and with articular cartilage in good condition [11, 19, 24, 34]. 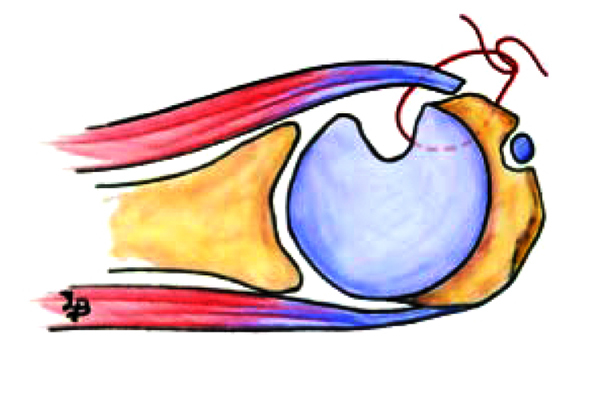 The surgical technique is performed through a standard deltopectoral approach, referencing the subscapularis tendon with stitches at the site of its insertion into the lesser tuberosity to prevent its medial retraction when disinserted. Next, a capsulotomy is performed to access the glenohumeral joint and to reduce the dislocation of the shoulder in the event that it remains dislocated. The condition of the cartilage should then be analyzed, as should the presence or absence of associated lesions. If the cartilage is in good condition, disimpaction follows, which includes internal rotation of the humerus and develop a bone hole on the opposite side of the humeral head. The fracture is disimpacted and reduced under the control of a direct view through the hole and using a bone impactor. The bone graft is inserted through the hole created to fill the existing gap after disimpacting the fracture. We prefer small fragment fixation using 2 parallel 3.5-mm cortical screws. The subscapularis tendon fixation is then performed in a position where a decreased range of internal rotation is achieved to prevent engagement of the glenoid at the lesion site. Bock et al. [37, 39], described a technique of disimpaction with good results. The allograft should be of a similar size to the defect of the damaged head; for this reason, it may be useful to perform radiographs of the contralateral side. Using a deltopectoral approach and after reference and detachment of the subscapularis tendon, a capsulotomy is made. After reduction of the dislocation, the state of the cartilage at the lesion site is analyzed, along with the range of rotation required to cause engagement of the lesion at the site of the posterior portion of the glenoid. 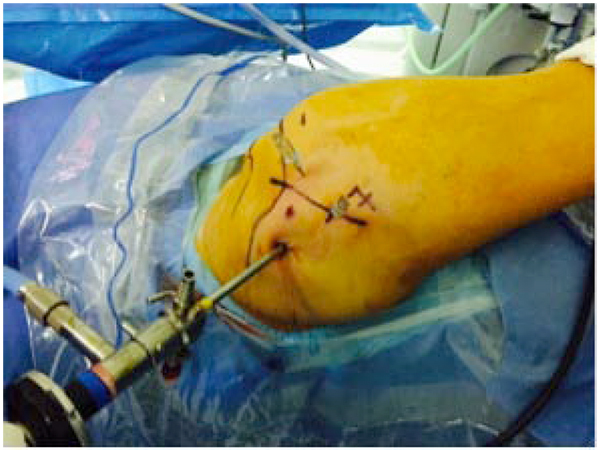 The preparation of the humeral defect is performed with a small oscillating saw, preparing a defect that is measurable and homogeneous. Subsequently, graft preparation is performed, using measurements slightly above those of the prepared bed to fit the allograft under pressure on its bed (Fig. 4). The graft is then fixed with 2 Herbert-type screws. The stability of the joint rotation should be checked via internal and external rotation, and it should be verified that the allograft does not rub against the glenoid in any range of motion. One can then proceed to reinsert the subscapularis and to perform the layered closure. Fig. (4). Reconstruction with allograft. The reconstruction of defects of the humeral head using an allograft restores joint stability, relieves pain, and leads to long-term clinical improvement in the patient [7, 43-53]. Gerber and Lambert [19, 42] reported a Constant score of 96 at 5 years of follow up with allograft reconstruction. Martinez et al. [43, 45-47, 50, 52, 53], reviewed 6 patients treated with allograft reconstruction of segmental defects of the humeral head. They reported that this technique has a good long-term follow-up result in 50% of the patients. Some complications are pain, instability, osteoarthrosis and collapse of the allograft. Gerber et al. [4, 44, 54, 55], reported excellent clinical results at a mean follow-up of 10.7 years after use of this technique. In a systematic review Longo et al. [37, 43, 53] reported a rate of postoperative complications after humeral allograft reconstruction of 74%. Mean postoperative Constat score was 76,2 and the rate of recurrence of instability was 0%. For defects greater than 50% of the articular surface or in the case of dislocations over 6 months in duration where there is poor bone quality, some authors advocate hemiarthroplasty or total shoulder arthroplasty as a treatment of choice [6, 22, 38]. In patients of advanced age with defects of approximately 40% and with low functional demands, arthroplasty would also be indicated. Although some authors advocate total arthroplasty as a treatment of choice, others base themselves on the state of the glenoid when deciding to place a full arthroplasty instead of a hemiarthroplasty [22, 27, 33, 34]. Hawkins et al. [4, 6, 43] reported that total shoulder arthroplasty is more reliable at pain relief and restoration of function than hemiarthroplasty. Although good results are obtained with this treatment, functional outcomes in cases of instability are below those that have been treated for osteoarthritis . In this case, we consider it essential to perform a computed tomography (CT) scan to assess bone stock and possible glenoid retroversion, which should be taken into account during surgery. Gravriidilis et al. [23, 34] reviewed 12 patients with shoulder arthroplasty after posterior instability. This treatment provided good midterm results with a significant improvement in the range of motion. Treatment of posterior glenohumeral instability through arthroplasty techniques has the highest rates of recurrence of instability compared with other surgical techniques. Longo et al. [37, 49, 56] reported a rate of recurrence of 14%. The rate of postoperative complications was 19% and the mean postoperative Constant score is 58,2. Reoperation occur in more than one-quarter of patients . The main causes of glenoid defects that lead to posterior glenohumeral instability include osteochondral fractures resulting from dislocations, increased retroversion of the glenoid or glenoid hypoplasia. 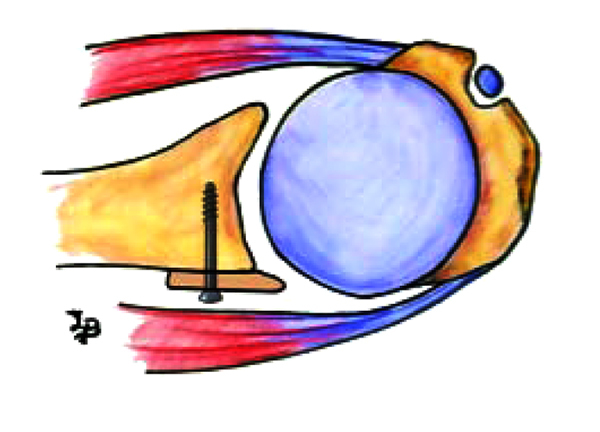 The main techniques for treating glenoid bone defects are posterior bone block and posterior opening osteotomy of the glenoid [7, 43, 46-53]. These procedures may also be indicated in the event of failures in the treatment of soft tissues with recurrent posterior instability [19, 50]. While classically this procedure has been performed using an open surgical technique [43, 46, 47, 50, 52, 53], in recent years, publications have described arthroscopic techniques and their results [4, 53-55]. The open procedure is performed with the patient in lateral decubitus and through a posterior incision in line with the axillary fold. After incision of the posterior deltoid, the space between the infraspinatus and the teres minor is dissected, and the capsulotomy is then performed. After decortication of the posterior edge of the glenoid, one proceeds with bone fragment osteosynthesis [43, 53]. The autograft is obtained from the iliac crest [4, 43, 52], although studies have been published in which the bone fragment is obtained from the distal clavicle [23, 54] or even from the distal tibia [49, 56, 57] (Fig. 5). Sirveaux et al. [50, 57], published a study with the use of iliac crest bone graft and acromion pediculated bone block. No patient in this study had posterior subluxation or dislocation postoperatively, Servien et al. , reviewed 21 patients treated with open posterior bone block, with average follow-up of 6 years and a Constant score of 93,3. The autors concluded that the bone block procedure could be a procedure of choice in recurrent posterior instability. Fig. (5). Posterior bone block. The autograft is obtained from the iliac crest. Barbier [43, 58] presented a report of 8 patients treated with iliac bone block autograft in average follow-up of 3 years. The mean postoperative Constant score was 96,25. Their study showed good and satisfactory results in 80% of cases at a mean of 3 years follow-up. In other hand, Meuffels [21, 52] presented poor long-term results of the posterior bone block procedure, with 36% of futher posterior dislocation. After 18 years osteoarthritis was present in all patients. Schwartz et al. [54, 59] performed 19 arthroscopic posterior bone block in posterior shoulder instability. At a median follow-up of 20,5 months the overall Rowe and Walch-Duplay scores improved significantly. Struck et al. 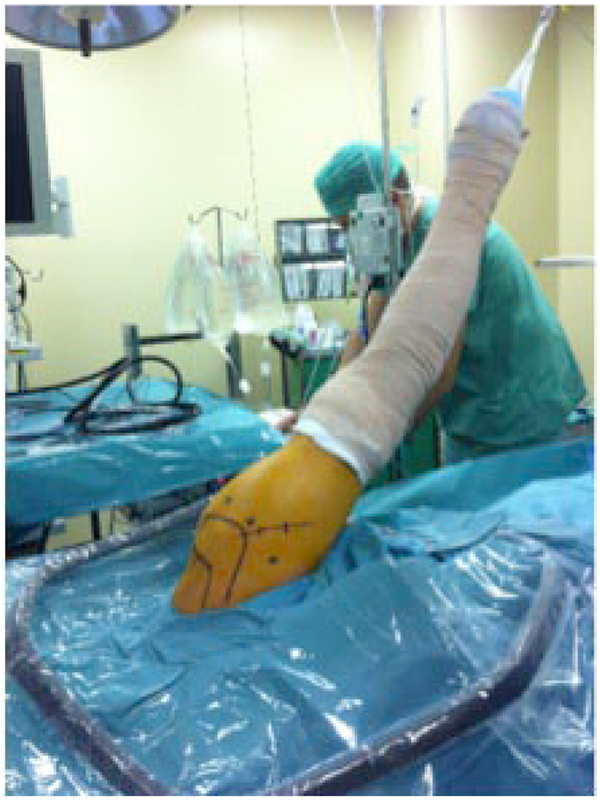 [57, 58] reported the results after open posterior bone block at long-term and short-term. The clinical results showed no clinical difference with good to verygood overall results in the subjective and objective scores. Treatment by posterior bone block improves posterior glenohumeral instability in both the short- and the long-term. Low rates of recurrence have been noted [57, 60]. 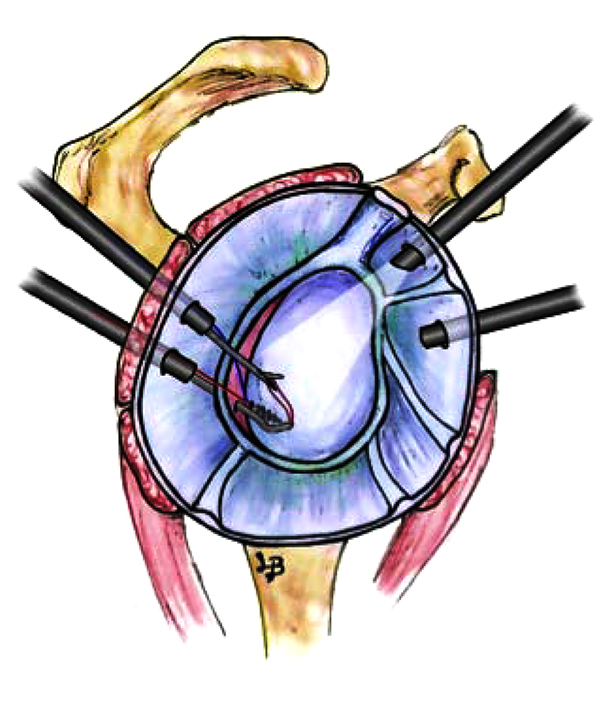 Glenoid retroversion has been defined as an angle in the sagittal plane greater than -7° [58, 61]. Hurley et al. [21, 59, 61, 62] reported retroversion angles of -10° in patients with posterior instability in comparison to the -4° angle of the control group. To correct glenoid retroversion, a posterior opening osteotomy may be performed at the site of the glenoid through a posterior approach to the joint. The osteotomy must be 1 cm medial to the articular surface [59, 63] and parallel to it, with the aim of opening the osteotomy without breaking the anterior cortex. An iliac crest allograft can be used, and the fixation must be performed with either 4.0mm screws or a small plate in the shape of a “T”. This procedure is technically demanding and has a high complication rate [5, 58]. Hawkins et al. [24, 60], described relatively poor outcomes with a complication rate of 41%. Norwood et al. [24, 61], reported 47% of instability after this procedure. In addiction, coracoid impingement and anterior dislocation haven been described following posterior glenoid osteotomy [59, 61, 62, 64, 65], and inadvertent penetration of the glenohumeral joint at the time of surgery can predispose to glenohumeral artritis [5, 63, 65]. Before arthroscopic surgery, all patients should be clinically evaluated at both shoulders in supine decubitus position. The presence of anterior, posterior or inferior glenohumeral translation should be assessed when there is an initial sulcus sign greater than 2 cm or when, after repairing an instability, there is a persistent sulcus sign greater tan 1cm in external rotation. The patient is placed in lateral decubitus at a 300 posterior slope (so that the glenoid surface is parallel to the ground). The arm is placed in a traction device at 45° abduction and 20° shoulder flexion with approximately 4-5 kg of longitudinal traction (Fig. 6). Fig. (6). The arm is placed in a traction device at 45° abduction and 20° shoulder flexion. The first arthroscopic portal we perform is posterior, approximately 2 cm inferior and medial to the posterolateral angle of the acromion [5, 37]. Under direct view from this portal, the accessory posterior portal is located using a spinal needle at approximately 1 cm inferior and lateral to the posterolateral angle of the acromion (posterosuperior portal) or the posterolateral accessory portal or portal 7, which is located 2 cm inferior and 2 cm lateral to the posterior portal or exactly 2 cm lateral and inferior to the posterior corner of the acromion (Fig. 7). The choice of one or another portal is defined according to the best direction obtained with the spinal needle for subsequent implant placement (Fig. 8). Finally, the standard anterior and anterosuperolateral portals are made. The arthroscope is inserted into the latter portal to assess the rear and front portions of the glenohumeral joint. Fig. (7). Posterosuperior portal and the portal 7. Fig. (8). The choice of one or another portal is defined according to the best direction obtained with the spinal needle for subsequent implant placement. An evaluation should be made of the dynamic stabilizers, especially the intra-articular portion of the subscapularis, the rotator cuff, and the long head of the biceps, along with the static stabilizers: the articular surfaces, the labrum and the glenohumeral ligaments, especially the posterior cord of the inferior glenohumeral ligament, which is the primary posterior stabilizer with the arm flexed and in internal rotation, and the middle and upper glenohumeral ligaments [24, 65, 66]. Posterior Bankart bone lesion or reverse Bankart bone lesion. Anterior Hill-Sachs lesion or reverse Hill-Sachs. Associated lesions: Superior labrum anterior to posterior (SLAP lesion) and Partial articular surface tendon avulsion (PASTA fracture); lesions to the upper, middle and inferior glenohumeral ligaments; and capsular redundancy. Fig. (9A,B). Kim lesion, lesion of the posteroinferior labrum. Arthroscopic repair of capsulolabral injuries, in any of their morphologies or presentations, is based on introducing the optical equipment from the anterosuperolateral portal and using the posterior and the accessory posterior (the posterosuperior or portal 7) as working portals. First, the capsulolabral complex must be detached, subsequently, the bone bed must be decorticated (Fig. 10A) until a bloody bed is achieved. In cases in which the labrum is to be reinserted into its bed, we use biodegradable anchors of the OSTEORAPTOR 2.9 (Smith & Nephew, Andover, USA) type with a simple high-resistance suture, which is placed through the posterior accessory portal. It is important to decorticate and clean the cartilage of the glenoid rim where the implants are going to be placed to facilitate cicatrization of the reinserted labrum. The drill guide is placed at approximately 7 o’clock and at an angle of more than 300 relative to the glenoid to avoid going very tangential and causing lesions in the cartilage (Figs. 11A, 11B) and the implant is inserted into the bed drilled into the glenoid [24, 67]. In the posterior or anterior portal (according to the surgeon’s preference), one of the ends of the implant is recovered with the thread clamp (Figs. 12A, 12B). To suture the labrum, we use 45° ACCU-PASS type clamps (Smith & Nephew, Andover, USA), which we introduce through the posterior or posterior accessory portal, depending on which portal allows us to make the stitch more easily (Figs. 13A, 13B). We set the stitch at approximately 6 o’clock, and we recover the carrier thread of the suture through the other portal (posterior or anterior, where we previously took out the anchor thread) (Fig. 14). It is important that the stitch that passes through the capsule and labrum be lower than where the implant was placed so that when knotting, the capsule remains retensioned. The two threads of the anchors are left in the same cannula (Fig. 15), and the first suture is knotted, achieving an upward fold of the capsulolabral tissue [64, 65, 68] (Fig. 16). Fig. (10A,B). The bone bed must be decorticated with manual scraping or with an arthroscopic shaver. Fig. (11A,B). The drill guide of the implant of the first anchor is placed at approximately 7 o’clock. Fig. (12A,B). The guide and the implant-inserting device are removed, and the implant is sutured in place. Fig. (13A,B). Recover of the suture for other posterior cannulated. Fig. (14). We set the stitch at approximately 6 o’clock whith 45° ACCU-PASS type clamps and we recover the carrier thread of the suture through the other portal. Fig. (15). The two threads of the anchors are left in the same cannula. Fig. (16A,B). The first suture is knotted. Subsequently, as many anchors are placed as required by the lesion size; for example, in an injury that extends from 6 o’clock to 9 o’clock on a right shoulder, we usually use four anchors placed at approximately 7, 8, 9 and 10 (Fig. 17), and with an approximate separation between each anchor of 5 to 7 mm. Fig. (17A,B). We usually use four anchors placed at approximately 6:30, 7:30, 8:30, and 9:30. Fig. (18A,B). We perform plication stitches by combining the use of anchors (hypoplastic or damaged labrum) with sutures without anchors when there is a labrum that has good morphological consistency. Posterior capsular plications are indicated primarily for patients with recurrent atraumatic subluxations associated with redundancy and/or capsular laxity without lesions of the posterior labrum and for traumas where a capsular fold is indicated together with the repair of lesions of the labrum. We perform plication stitches by combining the use of anchors (hypoplastic or damaged labrum) with sutures without anchors when there is a labrum that has good morphological consistency (Figs. 18A, B). Using a curved suture carrier, the posterior accessory portal is entered, and the capsule is traversed 10-15 mm lateral to the glenoid rim; we then remove the tip of the carrier through the insertion base of the labrum. The suture is removed through the posterior portal and is used to pass one of the ends of the anchors, which will then serve as a post. The procedure is repeated with another 3 or 5 anchors or simple sutures, depending on the size of the shoulder, the existing laxity, and the desired degree of plication, until the entire posterior capsule area is retensioned. To apply different plication stitches, the posterior and posterior accessory portals can be used interchangeably, depending on which one gives better access to apply the stitch in each case [5, 65, 69]. 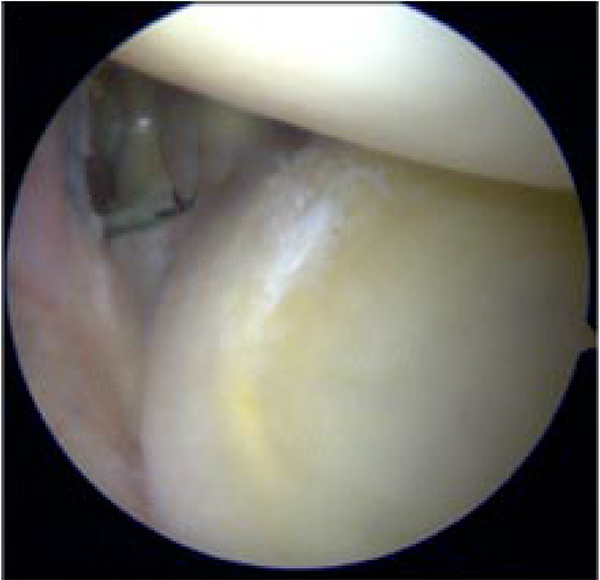 According to the literature, the combination of capsular plication together with posterior labrum repair has lower recurrence rates compared with labral repair alone [37, 70]. Interval closure is controversial [65, 66, 71]. We perform this procedure when there is a sign of a 2 cm groove or when, after repairing an instability, a groove sign > 1 cm with the arm externally rotated persists [57, 67]. The suture is made by removing the anterior cannula just behind the capsule. A thread is passed through the upper edge of the subscapularis and is recovered with a clamp passing through the upper glenohumeral ligament adjacent to the supraspinatus. One or two sutures are used for the closure. The knotting is completed with the arm in external rotation to avoid excessive tension. The operated shoulder is immobilized with a sling for 6 weeks, and cryotherapy is performed for 3-5 days post-surgery. On the first day after surgery, active exercises of the fingers, hand, wrist and elbow are initiated. One week after the intervention, passive mobility of shoulder abduction and flexion until 90° is reached, and from the 4th or 5th week onwards, the entire range of motion is achieved. From the 6th week onwards, active exercises are gradually started until complete mobility in all axes is achieved approximately three months after surgery. Muscular stretching work and muscle strengthening of the rotators, the deltoids and the periscapular musculature are initiated 2 months after surgery. Sport and work activities for patients with repeated or overhead movements can be initiated between 4 and 6 months post-surgery, depending on the type of injury, the sport he or she practices, or the type of work he or she performs. The most common complication is recurrence, which may be due to either a new lesion or failure of the initial intervention. Recurrence rates of treatment of posterior instability range between 0 and 10% [68, 72]. Petrera et al. [69, 73] reported recurrence rates of arthroscopic surgery of 6% compared to 6.7% for open surgery, without finding statistically significant differences. However, other studies refer to higher recurrence rates in open (9.2%) versus arthroscopic treatment (2.9%). Recurrence rates have decreased progressively due to improved surgical techniques, especially with the recognition of anterior Hill-Sachs lesions, as it is essential to determine the size and orientation of the lesion and the presence of engagement of the anterior Hill-Sachs lesion with the rim of the glenoid. Depending on the size and the presence or not of engagement, we must perform different surgical techniques on Hill-Sachs lesions, from subscapularis transfers alone or with bone fragments, filling bone defects with grafts, to prosthetic replacements, as have been described throughout the chapter. Contact sport athletes have higher recurrence rates [52, 70] after arthroscopic treatment, even though we believe that arthroscopic repair in this group of patients allows us to act with greater ease and less aggressiveness in the cases of posterior capsulolabral lesions and to perform subscapularis transfers at the site of Hill-Sachs lesions. The closure of the rotator interval has been proposed as a technique to reduce recurrence rates. Recent biomechanical studies have not shown that the arthroscopic rotator interval closure is beneficial for the treatment of posterior glenohumeral instability [26, 71]. One problem related to anatomical reconstruction techniques and posterior bone blocks in the treatment of posterior glenohumeral instability is recurrences due to reabsorption of the allograft used [57, 68]. Although avascular necrosis (AN) can occur as a result of a fracture-dislocation, AN risk increases with the degree of fracture displacement, the extent of the lesions to the tuberosities and the increase of time between the time of injury and treatment, such as in posterior inveterate dislocations [72, 74]. Immediate reduction and stable internal fixation favor the revascularization of the humeral head and decrease the risks of AN, which is why we must prevent further posterior inveterate dislocations by being very careful in the initial diagnosis. The development of osteoarthritis is a frequent complication. Aparicio et al. identified radiographic degenerative changes in most cases of their series after posterior fracture-dislocations, and Meuffels et al. show a series with 100% osteoarthritic changes after the use of posterior bone block. Treatment is based on symptomatology, which does not always need to have a correlation between symptoms and radiological findings. Initially, patients may benefit from nonsurgical treatment based on rehabilitation and retraining programs or modified activity and treatment with oral anti-inflammatories and painkillers. Total shoulder arthroplasty should be indicated in patients who do not improve or worsen with nonsurgical treatment. Shoulder stiffness is common in cases of posterior fracture-dislocations that have been delayed in the initial treatment, posttraumatic degenerative changes, deformities of the humeral head and AN . Treatment of stiffness will depend on the cause that generates it; in the absence of degenerative changes or collapse of the humeral head, arthroscopic capsulotomy followed by rehabilitation therapy improves functional outcomes. When stiffness is associated with degenerative changes or collapses of the humeral head, shoulder arthroplasty should be indicated. The stiffness after posterior instability surgery often appears as a loss of less than 10º of internal rotation, this loss may have little impact on most people but can cause major problems for throwing athletes (baseball, handball), tennis players, or swimmers. Although rare, there are other complications associated with the treatment of posterior glenohumeral instabilities, such as infections after open reduction and internal fixation , and nerve lesions, particularly of the axillary and suprascapular nerves, which may be injured during open surgery . The surgical techniques of the posterior glenohumeral instability should be planned according to each case on an individual basis according to the patient characteristics and the injury type. The indications for arthroscopic treatment are recurrent posterior subluxation caused by injury of the labrum or the capsulolabral complex; recurrent posterior subluxation caused by capsuloligamentous laxity or capsular redundancy; and multidirectional instability with posterior instability as a primary component. The most important complications in the treatment of posterior glenohumeral instability are recurrent instability, avascular necrosis and osteoarthritis. There are no financial and personal relationships with other people or organization that could inappropriately influence this work. Gerber C, Nyffeler RW. Classification of glenohumeral joint instability. Clin Orthop Relat Res 2002; (400): 65-76. OBrien SJ, Pagnani MJ, Fealy S, McGlynn SR, Wilson JB. The active compression test: A new and effective test for diagnosing labral tears and acromioclavicular joint abnormality. Am J Sports Med 1998; 26(5): 610-3. Rockwood CA, Matsen FA, Wirth MA, Lippitt SB. The Shoulder. London: Saunders Elsevier 2009. Lafosse L, Franceschi G, Kordasiewicz B, Andrews WJ, Schwartz D. Arthroscopic posterior bone block: Surgical technique. Musculoskelet Surg 2012; 96(3): 205-12. Hawkins RJ, Neer CS II, Pianta RM, Mendoza FX. Locked posterior dislocation of the shoulder. J Bone Joint Surg Am 1987; 69(1): 9-18. Bradley JP, Forsythe B, Mascarenhas R. Arthroscopic management of posterior shoulder instability: Diagnosis, indications, and technique. Clin Sports Med 2008; 27(4): 649-70. Burkhead WZ Jr, Rockwood CA Jr. Treatment of instability of the shoulder with an exercise program. J Bone Joint Surg Am 1992; 74(6): 890-6. Fronek J, Warren RF, Bowen M. Posterior subluxation of the glenohumeral joint. J Bone Joint Surg Am 1989; 71(2): 205-16. Bottoni CR, Franks BR, Moore JH, DeBerardino TM, Taylor DC, Arciero RA. Operative stabilization of posterior shoulder instability. Am J Sports Med 2005; 33(7): 996-1002. Tannenbaum E, Sekiya JK. Evaluation and management of posterior shoulder instability. Sports Health: A Multidisciplinary Approach 2011; 3(7): 253-63. Kim S-H. Posterior instability: clinical history, examination, and surgical decision making. In: Romeo AA, Ed. Shoulder Instability. 1st ed. Provencher, MT: Elsevier Inc 2012; pp. 281-93. Wilk KE, Macrina LC. Nonoperative and postoperative rehabilitation for glenohumeral instability. Clin Sports Med 2013; 32(4): 865-914. Johnson N, Pizzari T, Watson L, Wickham J, Balster S. Functional improvements and electromyographic (EMG) changes in multidirectional instability of the shoulder after conservative rehabilitation. J Sci Med Sport 2010; 13: 33-4. Bahk MS, Karzel RP, Snyder SJ. Arthroscopic posterior stabilization and anterior capsular plication for recurrent posterior glenohumeral instability. Arthroscopy 2010; 26(9): 1172-80. Blomquist J, Solheim E, Liavaag S, Schroder CP, Espehaug B, Havelin LI. Shoulder instability surgery in Norway: The first report from a multicenter register, with 1-year follow-up. Acta Orthop 2012; 83(2): 165-70. Engelsma Y, Willems WJ. Arthroscopic stabilization of posterior shoulder instability. Knee Surg Sports Traumatol Arthrosc 2010; 18(12): 1762-6. Leivadiotou D, Ahrens P. Arthroscopic treatment of posterior shoulder instability: A Systematic Review. Arthroscopy 2014; 24: 1-6. Tannenbaum EP, Sekiya JK. Posterior shoulder instability in the contact athlete. Clin Sports Med 2013; 32(4): 781-96. Bradley JP, Tejwani SG. Arthroscopic treatment of posterior instability-Surgical Technique. In: Provencher M, Romeo A, Eds. Shoulder Instability A comprehensive approach. Philadelphia: Elsevier 2012; pp. 305-23. Hurley JA, Anderson TE, Dear W, Andrish JT, Bergfeld JA, Weiker GG. Posterior shoulder instability. Surgical versus conservative results with evaluation of glenoid version. Am J Sports Med 1992; 20(4): 396-400. Gerber C. Chronic, locked anterior and posterior dislocations. In: Warner JP, Iannotti JP, Flatow EL, Eds. Complex and revision problems in shoulder surgery. 1st ed. Philadelphia: Lippincott-Raven 1997; pp. 99-116. Tokish JM, Fitzpatrick K, Cook JB, Mallon WJ. Arthroscopic distal clavicular autograft for treating shoulder instability with glenoid bone loss. Arthrosc Tech 2014; 3(4): e475-81. Van Tongel A, Karelse A, Berghs B, Verdonk R, De Wilde L. Posterior shoulder instability: Current concepts review. Knee Surg Sports Traumatol Arthrosc 2011; 19(9): 1547-53. Cicak N. Posterior dislocation of the shoulder. J Bone Joint Surg Br 2004; 86(3): 324-32. Robinson CM, Aderinto J. Posterior shoulder dislocations and fracture-dislocations. J Bone Joint Surg Am 2005; 87(3): 639-50. Ponce BA, Millett PJ, Warner JJ. Management of posterior glenohumeral instability with large humeral head defects. Tech Shoulder Elbow Surg 2004; 5: 146-56. Mclaughlin HL. Posterior dislocation of the shoulder. J Bone Joint Surg Am 1952; 24 A(3): 584-90. Martetschläger F, Padalecki JR, Millett PJ. 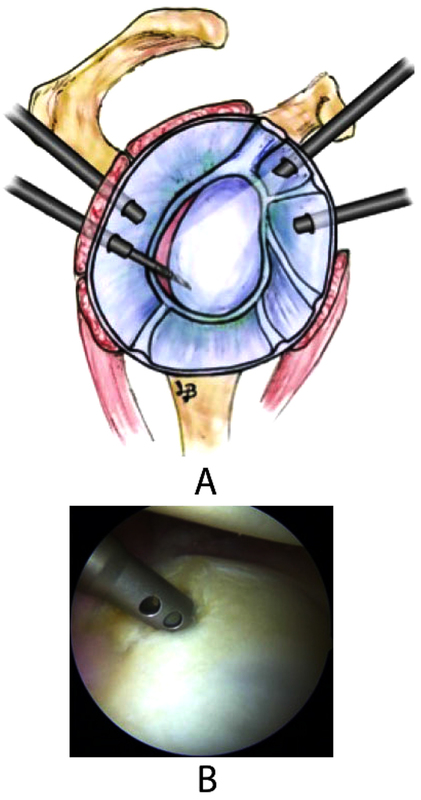 Modified arthroscopic McLaughlin procedure for treatment of posterior instability of the shoulder with an associated reverse Hill-Sachs lesion. Knee Surg Sports Traumatol Arthrosc 2013; 21(7): 1642-6. Krackhardt T, Schewe B, Albrecht D, Weise K. Arthroscopic fixation of the subscapularis tendon in the reverse Hill-Sachs lesion for traumatic unidirectional posterior dislocation of the shoulder. Arthroscopy 2006; 22(2): 227.e1-6. Spencer EE Jr, Brems JJ. A simple technique for management of locked posterior shoulder dislocations: Report of two cases. J Shoulder Elbow Surg 2005; 14(6): 650-2. Keppler P, Holz U, Thielemann FW, Meinig R. Locked posterior dislocation of the shoulder: Treatment using rotational osteotomy of the humerus. J Orthop Trauma 1994; 8(4): 286-92. Checchia SL, Santos PD, Miyazaki AN. Surgical treatment of acute and chronic posterior fracture-dislocation of the shoulder. J Shoulder Elbow Surg 1998; 7(1): 53-65. Gavriilidis I, Magosch P, Lichtenberg S, Habermeyer P, Kircher J. Chronic locked posterior shoulder dislocation with severe head involvement. Int Orthop 2010; 34(1): 79-84. Paul J, Buchmann S, Beitzel K, Solovyova O, Imhoff AB. Posterior shoulder dislocation: Systematic review and treatment algorithm. Arthroscopy 2011; 27(11): 1562-72. Walch G, Boileau P, Martin B, Dejour H. [Unreduced posterior luxations and fractures-luxations of the shoulder. Apropos of 30 cases]. Rev Chir Orthop Repar Appar Mot 1990; 76(8): 546-58. Longo UG, Loppini M, Rizzello G, et al. Remplissage, humeral osteochondral grafts, weber osteotomy, and shoulder arthroplasty for the management of humeral bone defects in shoulder instability: systematic review and quantitative synthesis of the literature. Arthroscopy 2014; 30(12): 1650-66. Wooten C, Klika B, Schleck CD, Harmsen WS, Sperling JW, Cofield RH. Anatomic shoulder arthroplasty as treatment for locked posterior dislocation of the shoulder. J Bone Joint Surg Am 2014; 96(3): e19. Bock P, Kluger R, Hintermann B. Anatomical reconstruction for reverse Hill-Sachs lesions after posterior locked shoulder dislocation fracture: a case series of six patients. Arch Orthop Trauma Surg 2007; 127(7): 543-8. Connor PM, Boatright JR, DAlessandro DF. Posterior fracture-dislocation of the shoulder: treatment with acute osteochondral grafting. J Shoulder Elbow Surg 1997; 6(5): 480-5. Finkelstein JA, Waddell JP, ODriscoll SW, Vincent G. Acute posterior fracture dislocations of the shoulder treated with the Neer modification of the McLaughlin procedure. J Orthop Trauma 1995; 9(3): 190-3. Gerber C, Lambert SM. Allograft reconstruction of segmental defects of the humeral head for the treatment of chronic locked posterior dislocation of the shoulder. J Bone Joint Surg Am 1996; 78(3): 376-82. Barbier O, Ollat D, Marchaland JP, Versier G. Iliac bone-block autograft for posterior shoulder instability. Orthop Traumatol Surg Res 2009; 95(2): 100-7. Gerber C, Catanzaro S, Jundt-Ecker M, Farshad M. Long-term outcome of segmental reconstruction of the humeral head for the treatment of locked posterior dislocation of the shoulder. J Shoulder Elbow Surg 2014; 23(11): 1682-90. Martinez AA, Navarro E, Iglesias D, Domingo J, Calvo A, Carbonel I. Long-term follow-up of allograft reconstruction of segmental defects of the humeral head associated with posterior dislocation of the shoulder. Injury 2013; 44(4): 488-91. Essadki B, Dumontier C, Sautet A, Apoil A. Posterior shoulder instability in athletes: Surgical treatment with iliac bone block. Apropos of 6 case reports. Rev Chir Orthop Repar Appar Mot 2000; 86(8): 765-72. Gosens T, van Biezen FC, Verhaar JA. The bone block procedure in recurrent posterior shoulder instability. Acta Orthop Belg 2001; 67(2): 116-20. Kropf EJ, Sekiya JK. Management of bony defects in shoulder instability. In: Cole BJ, Sekiya JK, Eds. Surgical techniques of the shoulder, elbow, and knee in sports medicine. Philadelphia: Elsevier 2008; p. 131. Millett PJ, Schoenahl J-Y, Register B, Gaskill TR, van Deurzen DF, Martetschläger F. Reconstruction of posterior glenoid deficiency using distal tibial osteoarticular allograft. Knee Surg Sports Traumatol Arthrosc 2013; 21(2): 445-9. Sirveaux F, Leroux J, Roche O, Gosselin O, De Gasperi M, Molé D. Surgical treatment of posterior instability of the shoulder joint using an iliac bone block or an acromial pediculated bone block: outcome in eighteen patients. Rev Chir Orthop Repar Appar Mot 2004; 90(5): 411-9. Wirth MA, Seltzer DG, Rockwood CA Jr. Recurrent posterior glenohumeral dislocation associated with increased retroversion of the glenoid. A case report. Clin Orthop Relat Res 1994; (308): 98-101. Meuffels DE, Schuit H, van Biezen FC, Reijman M, Verhaar JA. The posterior bone block procedure in posterior shoulder instability: A long-term follow-up study. J Bone Joint Surg Br 2010; 92(5): 651-5. Servien E, Walch G, Cortes ZE, Edwards TB, OConnor DP. Posterior bone block procedure for posterior shoulder instability. Knee Surg Sports Traumatol Arthrosc 2007; 15(9): 1130-6. Schwartz DG, Goebel S, Piper K, Kordasiewicz B, Boyle S, Lafosse L. Arthroscopic posterior bone block augmentation in posterior shoulder instability. 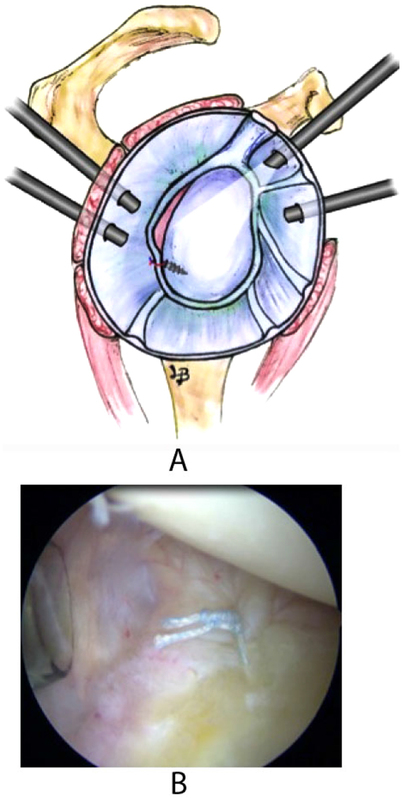 J Shoulder Elbow Surg 2013; 22(8): 1092-101. Smith T, Goede F, Struck M, Wellmann M. Arthroscopic posterior shoulder stabilization with an iliac bone graft and capsular repair: A novel technique. Arthrosc Tech 2012; 1(2): e181-5. Gupta AK, Chalmers PN, Klosterman E, Harris JD, Provencher MT, Romeo AA. Arthroscopic distal tibial allograft augmentation for posterior shoulder instability with glenoid bone loss. Arthrosc Tech 2013; 2(4): e405-11. Struck M, Wellmann M, Becher C, Pastor MF, Smith T. Results of an open posterior bone block procedure for recurrent posterior shoulder instability after a short- and long-time follow-up. Knee Surg Sports Traumatol Arthr 2015. Brewer BJ, Wubben RC, Carrera GF. Excessive retroversion of the glenoid cavity. A cause of non-traumatic posterior instability of the shoulder. J Bone Joint Surg Am 1986; 68(5): 724-31. Scott DJ Jr. Treatment of recurrent posterior dislocations of the shoulder by glenoplasty. Report of three cases. J Bone Joint Surg Am 1967; 49(3): 471-6. Hawkins RJ, Koppert G, Johnston G. Recurrent posterior instability (subluxation) of the shoulder. J Bone Joint Surg Am 1984; 66(2): 169-74. Norwood LA, Terry GC. Shoulder posterior subluxation. Am J Sports Med 1984; 12(1): 25-30. Gerber C, Ganz R, Vinh TS. Glenoplasty for recurrent posterior shoulder instability. An anatomic reappraisal. Clin Orthop Relat Res 1987; (216): 70-9. Johnston GH, Hawkins RJ, Haddad R, Fowler PJ. A complication of posterior glenoid osteotomy for recurrent posterior shoulder instability. Clin Orthop Relat Res 1984; (187): 147-9. Bradley JP, McClincy MP, Arner JW, Tejwani SG. Arthroscopic capsulolabral reconstruction for posterior instability of the shoulder: a prospective study of 200 shoulders. Am J Sports Med 2013; 41(9): 2005-14. Provencher MT, LeClere LE, King S, et al. Posterior instability of the shoulder: diagnosis and management. Am J Sports Med 2011; 39(4): 874-86. Provencher MT, Saldua NS. The rotator interval of the shoulder: anatomy, biomechanics, and repair techniques. Oper Tech Orthop 2007; 18: 9-22. Baker CL III, Mascarenhas R, Kline AJ, Chhabra A, Pombo MW, Bradley JP. Arthroscopic treatment of multidirectional shoulder instability in athletes: a retrospective analysis of 2- to 5-year clinical outcomes. Am J Sports Med 2009; 37(9): 1712-20. Robinson CM, Aderinto J. Recurrent posterior shoulder instability. J Bone Joint Surg Am 2005; 87(4): 883-92. Petrera M, Dwyer T, Tsuji MR, Theodoropoulos JS. Outcomes of arthroscopic Bankart repair in collision versus noncollision athletes. Orthopedics 2013; 36(5): e621-6. Plausinis D, Bravman JT, Heywood C, Kummer FJ, Kwon YW, Jazrawi LM. Arthroscopic rotator interval closure: effect of sutures on glenohumeral motion and anterior-posterior translation. Am J Sports Med 2006; 34(10): 1656-61. Warren RF, Craig EV, Altchek D. The Unstable Shoulder. Lippincott Williams &; Wilkins 1999. Aparicio G, Calvo E, Bonilla L, Espejo L, Box R. Neglected traumatic posterior dislocations of the shoulder: Controversies on indications for treatment and new CT scan findings. J Orthop Sci 2000; 5(1): 37-42. Bryan WJ, Schauder K, Tullos HS. The axillary nerve and its relationship to common sports medicine shoulder procedures. Am J Sports Med 1986; 14(2): 113-6.